Most house proud of people can often overlook their upholstery when it comes to housework. The trouble is that dust can affect every member of the household. If ignored, problems can lead both to your home and health. If you’ve ever plumped up couch cushions, then you’ll have seen tiny particles of dust, floating in the air. These eventually have to settle. When they do, they land on your carpet and furniture, creating what is commonly known as household dust. In addition, dirt gets trampled in on the feet of humans and pets, and this all adds to the problem. Most people think to get their carpets cleaned, but don’t include the couch or fireside chairs. The problem is that these items don’t receive regular vacuuming as your carpet may have done. Consequently, they’re crying out for attention. Everyone loves their couch. It’s frequently used by children and pets alike, so it’s little wonder that dirt and stains appear. Prevents damage – Tiny particles of dirt which land on your couch and upholstery get ground in. This will eventually result in wearing away of the fabric. Keeps your home healthier – These same dust particles contain allergens. It can be harmful to family and friends and may trigger allergic reactions. In addition, they lower the quality of the air which is breathed in by everyone. By having dust mites, dirt, and other pollutants, professionally removed from your upholstery, it helps to minimise the risk of allergies occurring and keeps your environment healthier. Freshens up your furniture – Bacteria can get deep into your upholstery causing unpleasant odours. 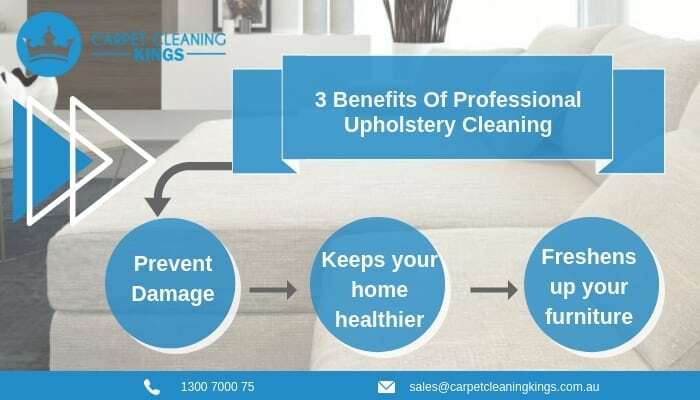 By having your upholstery professionally cleaned, it will make it smells clean and pleasant and give it a new lease of life, making it look new once more. When it’s time for your hot water extraction carpet cleaning to be arranged, why not include extra in the budget, so that you can get your upholstery cleaned at the same time? It’s important to remove all surface grime and dust before it has time to prematurely wear away your furniture and carpets, as well as impacting on your health. At Carpet Cleaning Kings, we’ve been in the industry for many years. We specialise in all aspects of carpet and upholstery cleaning, including mattresses. Why not give us a call on 1300 700 075 today to see just how we can help you.